Page File El Reg bookworm Mark Diston looks the latest from three female authors in the publishing world covering very different areas. Making a very impressive debut in fiction is Claire Fuller's fantastical tale of survival. Nessa Carey explains some of the lesser known, yet fascinating facts of bioscience, and Yasmin Alibhai-Brown takes a look at British culture and its growing diversity. Claire Fuller is an artist who only began writing aged 40. Our Endless Numbered Days is her debut novel and is a modern day fairy story which tells the tale of eight-year-old Peggy Hillcoat, who is taken away to live in a hut in a German forest by her survivalist father. “Sleeping Beauty? my father asked, and turned to look at me. “Little Blue Riding Hood? I sat beside him on the log and poked at the fire with a stick. He pulled the balaclava off my head by its ears and flung it behind him toward the tent. Peggy/Punzel’s father tells her that everyone has died and that they are the only two humans left. However the original story takes place in 1976 and is interspersed with a flash forwards to 1985 where a seventeen-year-old Peggy has emerged from the forest and is reunited with her German pianist mother and brother. The tale of her time in the wilderness and how she uncovers her father’s lies and their consequences make up the main storyline of this novel. And I have to say Our Endless Numbered Days is an excellent work. 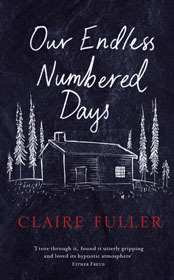 Claire Fuller possesses a refreshing understated literary style, she is an accomplished and complete writer. There are few eminently quotable passages, yet neither is there any slack. “I pressed the keys once more, harder this time, and let my fingers follow the flow and pattern they knew by heart. I was aware of Ute turning towards me, of a sharp intake of breath which she held while I played, but I closed my eyes and went into the music. And when Ute propped open the piano lid, the room was filled with a magical sound and I knew the music came from somewhere real and true”. So how good is this? The best debut novel by a long way so far this year. Indeed, better than most of Angela Carter. Claire Fuller reminds me of a latter-day E.T.A. Hoffman; she is that good and I look forward to hearing a lot more about her.